Check out SSB interview center allotment list and cut off marks of SSC Tech 42 course here. Army has officially published list of shortlisted candidates for SSB interviews of SSC Tech 42 course today. Indian Army has published complete list of shortlisted candidates today. There are total 30,200 candidates shortlisted for SSB interviews by Army. SSb interviews will be held at Bangalore, Bhopal and Allahabad Services Selection Board of Army. Cut off for SSC Tech 42 men course is set as 64% and above for engineering graduates. SSB interview dates of Bangalore SSB center are announced by Army. Still Bhopal and Allahabad SSB center dates are awaited. 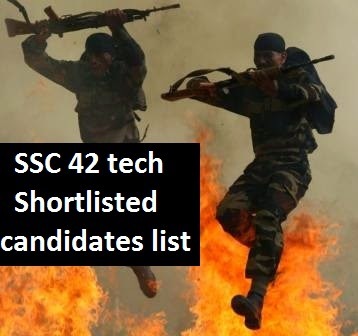 Here, we have provided complete list of candidates who are shortlisted for SSC Tech 42 course. SSB center allotment list of SSC 42 Tech course. We advise all candidates who have been shortlisted to prepare for SSB interviews from now onward. Update : Check out Allahabad SSB dates of SSC Tech 42 course.